Made with 100% Cotton, this Short Sleeve black Guinness® Print T-Shirt was created with the fans and players in mind. With soft-to-the-touch fabric, a short sleeve, and a classic comfortable fit, this tee is ideal for everyday wear. 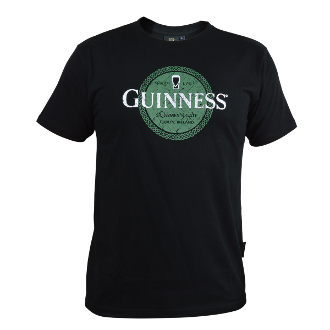 Guinness® Official Merchandise This product celebrates an extraordinary brand, which for over two centuries has been held in great affection around the world. For many, Guinness® has come to symbolise a way of life, always with style, wit and good humour. This product is intended for purchase and enjoyment by people of legal purchase age for alcoholic beverages.